2020 will be our 40th anniversary as a Rose society. Message from Virginia Foster, President of the HRS. Dear Fellow Rosarians: Welcome to 2019 and the wonderful winter weather that came with it. As I look out at our snow-covered garden, I am sure I am not alone in looking forward to the Spring. I can’t wait to get back out into the garden to see what is going to come up again after surviving the winter and start planning for new elements we want to add. Speaking of new additions to our gardens, the roses we sell have been ordered for May, with a variety to choose from, so watch for details at the April meeting. In preparation for the coming rose year, we have already booked some of our guest speakers, check Edna’s report later in this edition for details. We also need to line up our volunteers for tending the Millennial Garden, as well as for selling roses at the farmer’s market; sign-up lists will be available at the first meeting. Please mark your calendar for Tuesday, April 16th at the Dorian Parker Community Centre. We had our first board meeting in January, when we welcomed Michelle Lynch and Lynne Melynk to the executive. What a great group of volunteers we have; our meetings include lots of laughs in amongst the serious discussion about the coming year. Stay warm and cozy through these remaining cold months; we look forward to seeing you at the April meeting, and will send out another newsletter in the meantime. Our first meeting of the New Year is Tuesday April 16th At the Dorian Parker Centre, 227 Sunnidale Rd. Barrie Our Speaker is – Elizabeth Schleicher, of the Hamilton/Burlington Rose Society Her presentation title is ‘Copenhagen Adventures’. She and her husband visited Denmark, attending the triennial convention of World Rose Societies in 2018. Results of Photo Competition. Are you thinking of spring, the garden and roses? If not, we are here to help YOU to get in the mood. We have ordered 17 varieties of roses, 146 in total which will be available at 3 Farmers’ markets; two in Orillia and one in Barrie, Saturdays – May 11, 18, 25 You are not quite there yet? Well, here are a couple of exciting roses from the past that should get you in the mood. This is Boule de Neige (Ball of Snow) a Bourbon Rose by David Austin. Breeder: Lacharme, France –1867. She is richly fragrant, camellia like white flowers, exquisite form, slender growth and repeats well. I have heard that you can cook and bake with roses, and I was wondering if this is true and if so, can you share an easy recipe or two to get me started? Roses have been used as garnishes and centrepieces because of their elegant colors and delicate texture for a very long time. While roses are certainly a lovely decoration for any room, I encourage you to invite them into your kitchen as well. Every variety of rose is edible, and each one offers a uniquely sweet and floral flavor. A fragrant rose will generally be more flavourful, so follow your nose when selecting roses for cooking. Fresh Rose petals (violets can also be used) Make a syrup of sugar and water by boiling together until slightly thickened. Stir in rosewater or almond extract. Let syrup cool a little. Place a few rose petals in the syrup and coat both sides. Remove to wax paper with a slotted spoon. Let petals become totally dry before storing them in an airtight container. Use them to decorate cakes or other desserts and really impress your guests. Our Canadian Rose society needs help, a communique was sent out recently asking for assistance. They need a President, secretary and executive directors. If any individual is interested, please let them know. The situation is very serious and without help the society may have to dissolve. The Huronia Rose society (HRS) has responded with suggestions and offered help in a variety of ways. A future meeting with the CRS will determine its future, we will keep you updated. David Austin will be sadly missed. David was born (16 February 1926 at Albrighton – and passed away 18 December 2018 in the same village) He was a British rose breeder and writer who lived in Shropshire, England. His emphasis was on breeding roses with the character and with the fragrance of old garden roses but with the repeat-flowering ability and the wide colour range of modern roses such as hybrid teas and floribundas. Austin roses have always been a favorite of mine and I find them extremely hardy even in our harsh Canadian winters. 5. Most importantly – the opportunity to learn all about Roses from fellow rose growers and our guest speakers. We are nearing the end of summer, but still enjoying our roses in the garden. We have been in our new home for 1 1/2 years now, and the roses transplanted have produced wonderful blooms this season. The new rose bushes that we bought this year have been settling in well, producing quite a few flowers. The HRS has received an open invitation from the Royal Botanical Gardens in Hamilton, to go and see the most recent addition to their Rose Gardens. We are thinking of going next year sometime and will likely arrange car pooling for those interested. Please talk to a member of the Executive if you think you would like to be part of the trip. July has been a very busy month with the annual Rose Show and the Annual Garden Visit. Thank you to the many volunteers, participants, and attendees that made the show another resounding success. This year, the visit brought us to Janice and Tim Schmidt’s beautiful gardens; the weather was wonderful, and there was a wide selection of refreshments and finger foods to nibble on. There is so much to see in their garden, so many paths to travel, and just as enjoyable just to sit and chat and relax. Many thanks to our gracious hosts for the lovely evening. We have two meetings left this year, in September and October, so if you know of someone who might be interested in coming, please do invite them along before we all hibernate for what we hope will be a quick winter. Do enjoy the rest of the newsletter, we look forward to seeing you on the 18th! 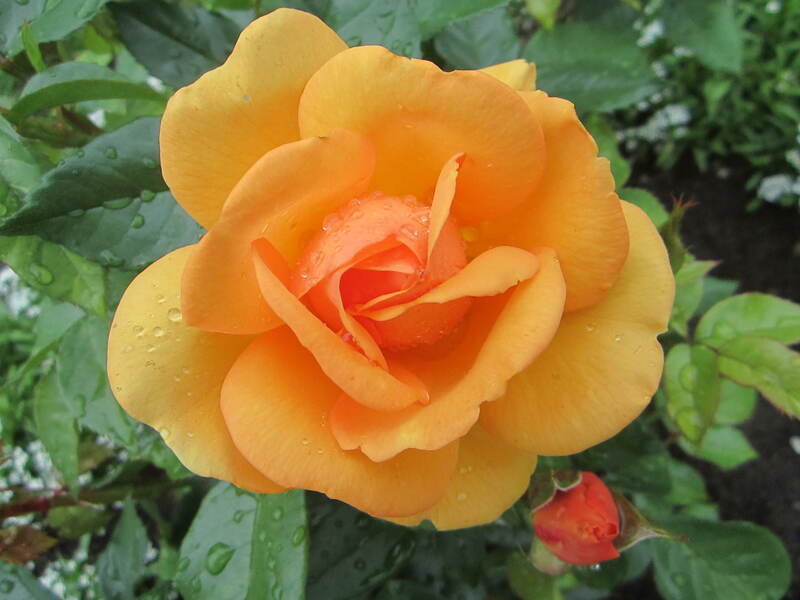 Sept. 18 Topic is “Carefree and Carpet Roses” presented by a Simcoe County Master Gardener, Anna Sauve. These types of roses are named “landscape roses”, as they are low-growing and everblooming, according to their publicity. 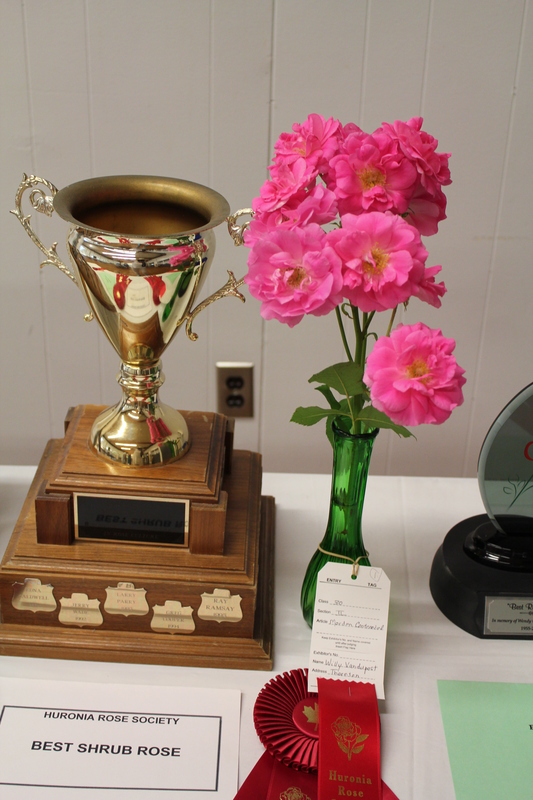 We will have the Rose Show Awards presented to start the evening, and then enjoy our speaker after refreshments. Oct. 23 (note the 4th Tues. of Oct.) – Topic is 2017 “International Rose Trials Winners” by Ethel Freeman, a member of the Canadian Rose Society. There are 23 trial gardens around the world each year. These trials allow the breeders to test and showcase new varieties (some already introduced and some not). Ethel will talk about the value of the trials and show photos of the 2017 winners and about half of the 2018 ones so far. This way we can see the trends in hybridizing and what is coming. Many thanks to the members who have helped with pruning the roses In the spring and deadheading this summer. All our garden volunteers tell of the positive comments they get from the passersby when working at deadheading the roses, proof that how important this garden is to the public. The drought was hard on the roses, they didn’t come back for their second flush of bloom as quickly. The tap right beside the garden that the city installed has been an immense help, but after the second fertilization, 12 bags of mulch were spread. Some weeds still showed up, but this cover of shredded cedar kept the soil evenly moist. We are updating the interpretive sign beside the garden. This past summer I had a new pest arrive in my garden. I think it is the Japanese beetle. How can I stop them from devastating my roses? You are correct, the Japanese beetle has finally arrived in our area. They are non-discriminating as they don’t really care what they eat, their diet can consist of over a hundred different plants with roses being one of their favorites. They originally came from the Japanese islands and because they were surrounded by water and were food to many natural predators they were kept under control but since the exportation of plants in soil from the area it is now our problem. Laws have stopped the shipping of plants in soil, but it is too late as they are already here. Unfortunately, there is not a lot you can do. I know that pesticides will help but not only will they kill the bad bugs, but they will also kill the good bugs too. Therefore, this is not an option. Always remember that a healthy rose that is well watered and fertilized will survive an attack better than a rose that is weak and suffering. So good horticulture is called for. The time to act is when you see one beetle, as they release pheromones into the air that attract more beetles to come to your garden. So early detection is critical to success in managing this ravenous pest. Plant geraniums or place potted geraniums near your rose bushes, the beetle will be attracted to the geranium and start to feed. This plant contains geraniol oil which is toxic to the Japanese beetle. It will render them disorientated, dizzy, and paralyzed until death. Keep the garden clean, make fresh water available to attract the good bugs many of which would be natural predators that will help to eliminate pests in general. Plant as companions to your rose bushes, garlic, chives, and rue that will help to keep the beetles and other pests away. Don’t be fooled by traps, experts say this just brings in more beetles because of the release of pheromones and the traps can’t handle them all. This is one more challenge for rose growers, but I know we will persevere and not give up as there is no other flower as beautiful as the rose. In memory of Reta Caldwell – a plaque will be placed in front of the grouping of “Champlain”, the reddest of the Explorer roses and Reta’s favourite colour in roses. 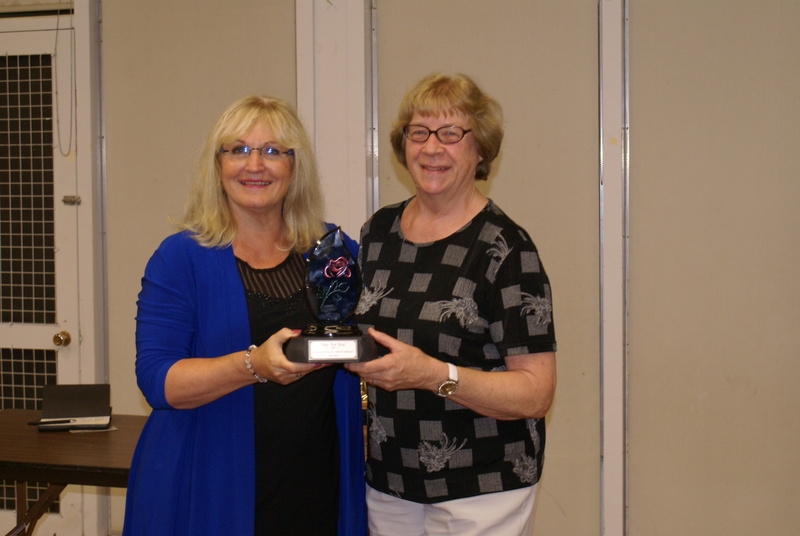 This recognizes Reta’s almost 40 years of involvement with HRS, as a charter member in 1980 and active in many ways right until her final months. Our photographic competition is celebrating several years of success. The number of entries were 48, in 2015, 62 in 2016 and 43 in 2017. Please bring this year’s entries to our October meeting with completed entry tags. Extra tags will be available at our September meeting if you need some. Is 2018 your year to win the best photograph in the show? All entries are judged by Don Komarechka who is an award- winning nature and landscape photographer who lives in Barrie. So, get ready, the competition is on! Virginia Foster, President of the HRS. Summer is just about here, and the roses have arrived and have been sold in the Farmers’ Market. Many thanks to the volunteers that worked the booths to make this happen. This annual fundraiser helps us to continue our programming, and we appreciate the time you give to make sure it is a success. 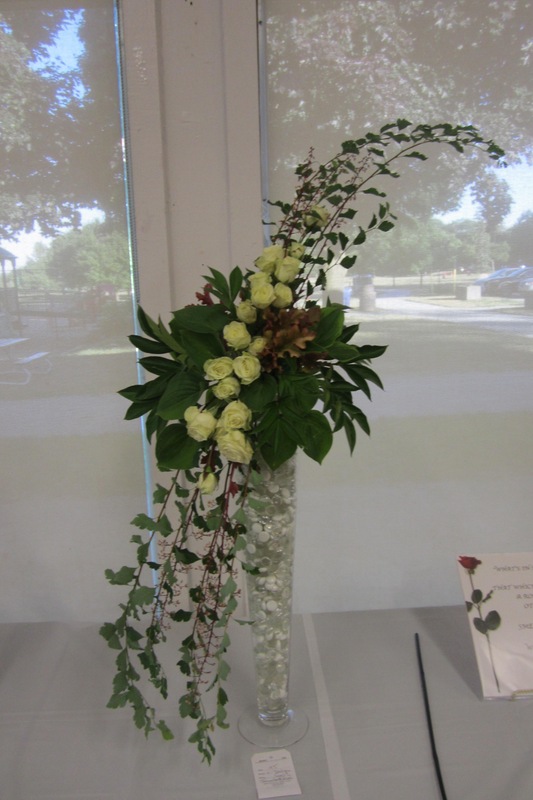 We are all looking forward to July 3rd with great expectations for the wonderful specimens that will be shown at the Annual Rose Show; with the theme of “Poetry in Roses”, it is sure to be an interesting and dynamic event. Even though the last meeting was delayed due to the weather, we had a great turnout for “The Roses of Biltmore” presented by Gloria Brok. The photos that were shown made all in attendance want to arrange a trip down there and see for themselves, the buildings and the gardens with numerous displays of roses. After the rose show on July 3, our next event is just for you, our members and spouses/friend. On Tues. July 17, you are all invited to Janice and Tim Schmidt’s beautiful garden for our annual Garden visit. We gather at 6:30 pm at their wonderful rose and perennial gardens created by Janice and Tim themselves at 27 Murray St., Barrie. Bring a lawn chair, some snacks and juice AND your camera (remember HRS photo competition!). This is a relaxing time to see a gorgeous garden and enjoy a social time with our members. I would like to thank the following volunteers for their hard work at this years CARP sponsored spring into green show. Edna Caldwell, Ellen Spencer, Lynn Schnitter, Virginia Foster and Janice Schmidt. We distributed many brochures on how to grow and maintain roses and sold a few rose photos and a mug. However, the main reason for our participation was to market our society and promote the sale of roses at the farmers market and we are pleased to say that many of the people we spoke to did visit us at the market and purchase roses. Therefore, a good return on our investment of time. The pruning and fertilizing was completed in May. In late June volunteers are necessary to keep the gardens looking clean and to encourage continuous blooms. Would you be able to give an hour or two once a month this summer to assist one of our volunteers who have already committed to once a month to deadhead the dying blooms? We will have a training session once the roses start to bloom, showing all our volunteers exactly how to do this. Please contact Edna at ednacaldwell@rogers.com or 705 721-0484 if you will help, to sign up. “Many hands make small work” definitely applies to keeping our much-appreciated rose garden attractive. Rose Gardens at Royal Botanical Gardens -the official opening of the newly renovated Rose Garden at the RBG is taking place on June 23, the same time as the Hamilton-Burlington Rose Society’s rose show. Any of our members would be welcome to attend both events at the RBG. There are preliminary plans at HRS to visit the rose garden in late summer. A sign-up sheet to show your interest in taking a car tour will be at our rose show on July 3rd. A big thank you to Michelle Lynch who assisted greatly with the sales of hostas. They were sold along with beautiful bunches of fresh rhubarb from her garden as an additional fund raiser for our society. Photos taken in 2017 and 2018 may be submitted except for entries from a previous Huronia Rose society photographic competition. The photographer/s of the winning entries may be asked for permission to use the images on the Huronia Rose society greeting cards. Digital access or the original photos should then be supplied. A sincere thank you to everyone who took time to help with the Annual Fundraising Event, the sale of potted rose bushes and perennial plants. Judith, Ruth & my daughter-in-law, Kelly for picking up the roses from St.Catherines and Virgil rose nurseries. Carl, Charlotte, Dale, Ellen, Janice, Michelle and for tending the Farmers’ markets in Barrie and Orillia, and executing good salesmanship. Ellen and Ron for giving up their garage as storage for the roses. The members who picked them up from Ellen and brought to the markets. Edna for rescuing rare hosta plants last fall with the help of Janice and Ina. Planting them in her garden and now in the spring with Michelle’s help, potting up to be sold as part of the fund raising in conjunction with the roses. If I missed to mention any helper – Many thanks. Many tasks and planning are required to bring this Event up and running. We purchased 150 Rose bushes and I am happy to report that all have been sold. 7. All specimen blooms must be grown by the exhibitor.Please indicate name of rose if known. 9. The Huronia Rose Society or the Show Committee are not responsible for loss, damage or theft. 10. Ribbons are attached to winning entries. Trophies will be awarded at the September meeting. Trophies shall remain the property of the Huronia Rose Society. 11. Judges may withhold an award if an entry is not deemed worthy.Judging decisions are final. 13. The Show Chairperson has the right to divide any specimen class. A minimum of three of one colour, size etc. is required to warrant such a division. 14. 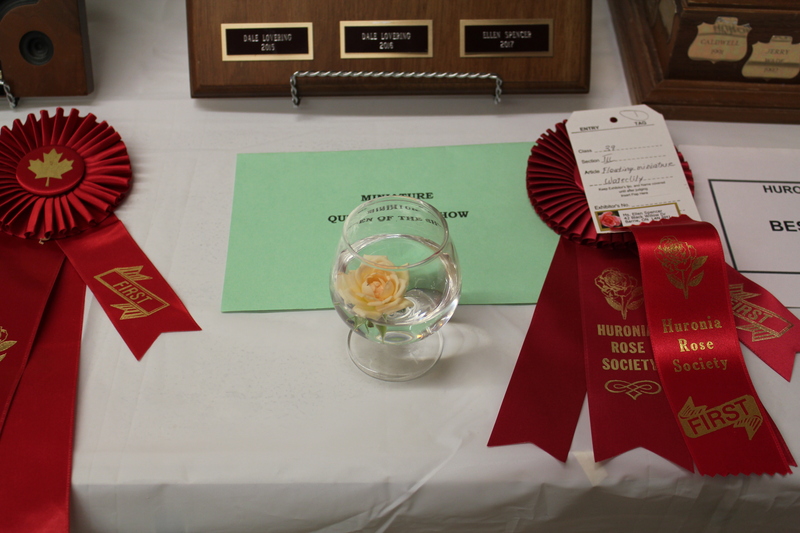 Entry tags should be correctly filled in, if possible, prior to arriving at the Show,including the name of the rose, if known. Securely attach the tag, except in Miniature and Decorative Sections, where they should be placed under or beside the entry. 15. Each exhibitor is responsible for placing their entries in the correct class. The Canadian Rose Society Colour Classification Guide should be consulted. Ask the passing clerks for help if unsure, before marking your tag. 19. In the Decorative Division, all designs must include rose(s) or some part of a rose plant, which may be obtained from any source. Any type of plant material, branches or decorative wood, dried or treated, may be used. A judicious use of painted material is permitted. Accessories are also permitted. Space allotted: 24” wide and 30” deep. No height restrictions. In the following Classes, a blend of any colour is to be shown in the Class closest to that colour. i.e. a Red Blend Hybrid Tea would be shown in Cl. 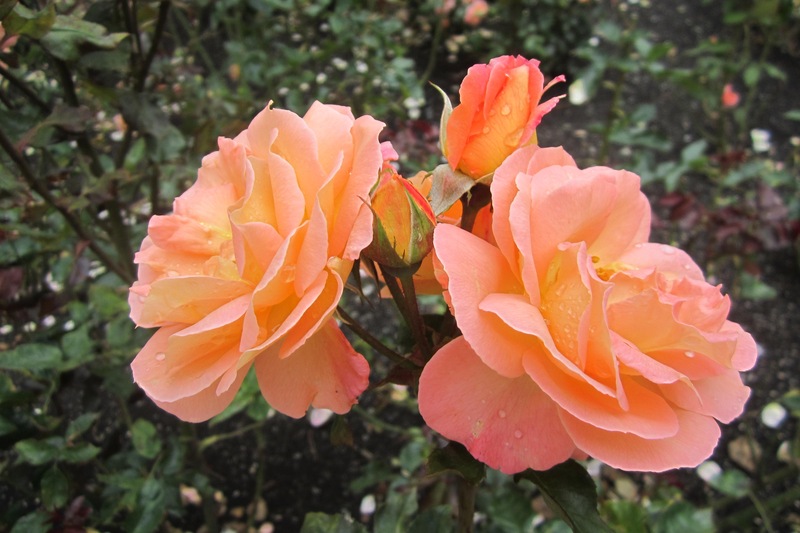 4; an Orange Blend Hybrid Tea would be shown in Cl. 7. 34. One bloom, any colour or blend (not miniature) floating in a suitable container, No foliage. Note: the rose MUST FLOAT. 35. Most fragrant rose, one stem. *Also to be judged by the public. 39. One bloom Miniature, any colour or blend, floating in a suitable container. Note: the rose MUST FLOAT. No foliage. A Reminder from Virginia Foster, President of the HRS. We are now into Spring as of March the 20th and looking forward to getting outside and into our gardens and getting them into shape. Don’t forget that our first meeting of 2018 will be held on TUESDAY, APRIL17th at 7pm at the Dorian Park Community Centre. This is a great time to renew your annual membership and pick up the schedule for this year. The Members’ handout gives the details of speakers, events, sale of roses, etc. This year CARP is hosting their first annual “Spring into Green ECO Show at the Holly Community Centre at 171 Maple Ave. It is on Sunday, April 22, 2018 from 10a.m. to 4p.m The HRS has booked a booth to help promote the Huronia Rose Society, so if you visit the Show, please drop by and say hello. We look forward to seeing you at the next meeting and do bring a friend with you if you can. This is a great time to renew your annual membership and pick up the schedule for this year. The Members handout gives the details of speakers, events, sale of roses, etc. Want to learn more about roses in a friendly atmosphere? Come grow with us at Huronia Rose Society. The Ontario Horticultural Association has a spring meeting on April 21st, at Tangle Creek Golf Course that Edna Caldwell and I will attend. We will sell our cards and publicize the HRS. We attended the meeting last Autumn and sold several cards there with many compliments of the photos of the roses. Gloria Brok, our presenter on April 17th. This is the third time Gloria and her husband have visited us with very informative programs enhanced with marvellous photography. She will share the many photos she captured of the rose gardens of the Biltmore Estate in the mountains of North Carolina when they visited in last October. Gloria also had the opportunity to speak with one of the gardeners and learned a lot about how they winterize and prune their thousands of roses each year. 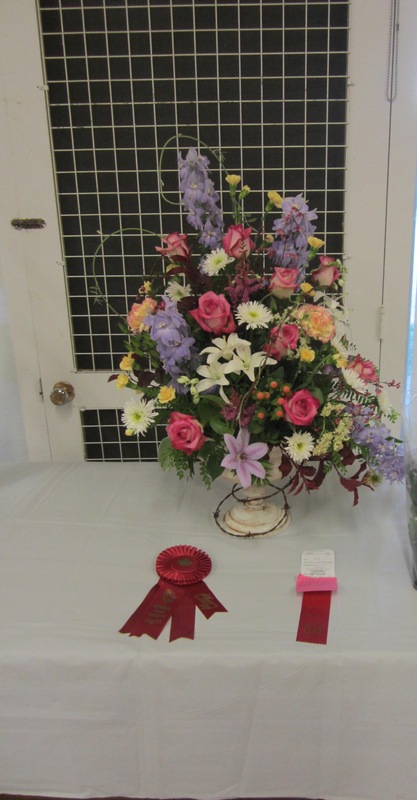 July 3rd Annual Rose Show & Meeting Set up: 4:30pm. Entries received: 4:30 – 6:15pm Program: 7 pm. We need pots for the planting. Please bring them to Edna’s or call her for pick-up. Also: We are asking for volunteers to help with the potting. Our first meeting was after last year’s show to debrief and make changes. Our second meeting was on March 21, 2018 to finalize the schedule and determine a theme and the design classes. The team is very energetic and creative believing that the show in 2018 will be dynamic in every respect. 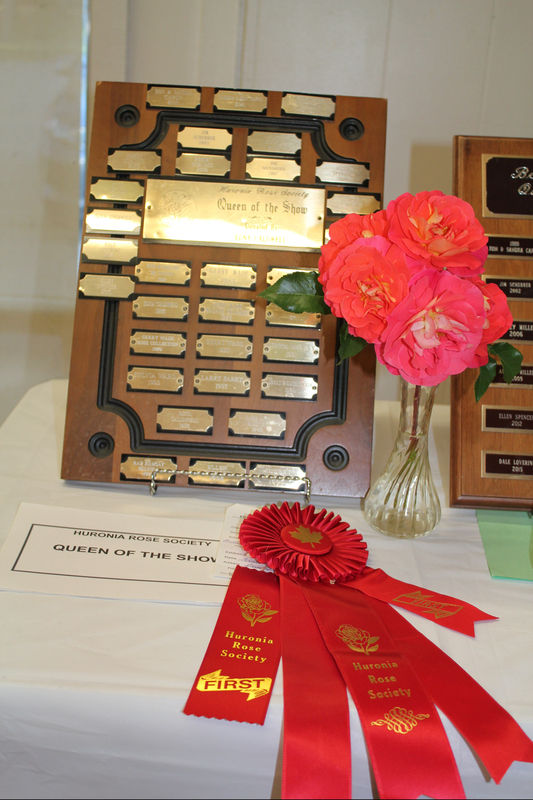 The rose show schedule will be circulated as soon as it is complete so please mark your calendars for July 3rd and attend the April 17t h general rose meeting at the Dorian Parker Center to pick up your entry tags. This is your year to win a red ribbon or perhaps even a trophy. I look forward to seeing all of you at our spring meeting. It has been a long winter and it will be nice to socialize, to sit back and listen to our guest speaker and look at all the glorious pictures of roses submitted last October for the photographic competition. Our renowned judgeDon Komarechka mentioned that he has seen a vast improvement in the quality of the photographs and looks forward every year to have the opportunity to judge our pictures. We will see you soon, and I look forward to congratulating this year’s grand prize winner! We are very pleased to announce that we are going to participate in the first annual “Spring into Green Eco Show” to be held on Earth Day, Sunday, April 22nd, 2018 at the Holly Community Centre, 171 Mapleton Avenue here in Barrie. As members of the Huronia Rose society you will want to attend to see organizations that are Eco friendly. Our society will be one of 40 different exhibitors/vendors promoting sustainable eco-friendly services or products. We will be promoting chemical and pesticide free growing and care of roses as well as talking about our hardy roses on sale at the Farmers market. We hope to see you there. Any questions please call Janice at 705-728-7719 or email at jantim200698@gmail.com. We will hold a pruning session at the Memorial Garden, #205 Lakeshore Dr., Barrie about mid April depending on the weather and volunteers’ availability. If you are afraid of pruning roses, this is a great FREE workshop to learn the techniques. Also, we need folks to cut up the branches and twigs, easy but very important jobs. Please give this opportunity some thought and contact Edna 705 721-0484. At the April meeting, we will have signup sheets for basic tidying up the rose garden through the summer months. Please consider offering a week or two, especially from the third week of June until the end of August. It is with a heavy heart that I mention the passing of Ligita Preisbergs’ beloved husband Raimonds. You and your family are in our hearts and prayers. This is my first newsletter as president of the H.R.S., and I am pleased to report that the Executive Board has been working hard already, planning for the coming year. We have several interesting guest speakers lined up, covering such topics as historical roses, varieties of roses, and international competitions. Our first meeting will be on APRIL 17th, 2018, starting at 7p.m. – please mark your calendar, and invite friends who may be interested as well. If any of your neighbours have ever complimented you on your lovely rose garden, use this as an opportunity to bring them out! We will continue to meet at the Dorian Park Community Centre located at 227 Sunnidale Road in Barrie. If you’re not the type to skip to the last page of whatever you’re reading, I’m going to recommend that you do today so that you don’t miss the annual membership form! Maintaining your membership helps the HRS to continue providing valuable education and regular times to get together and connect. 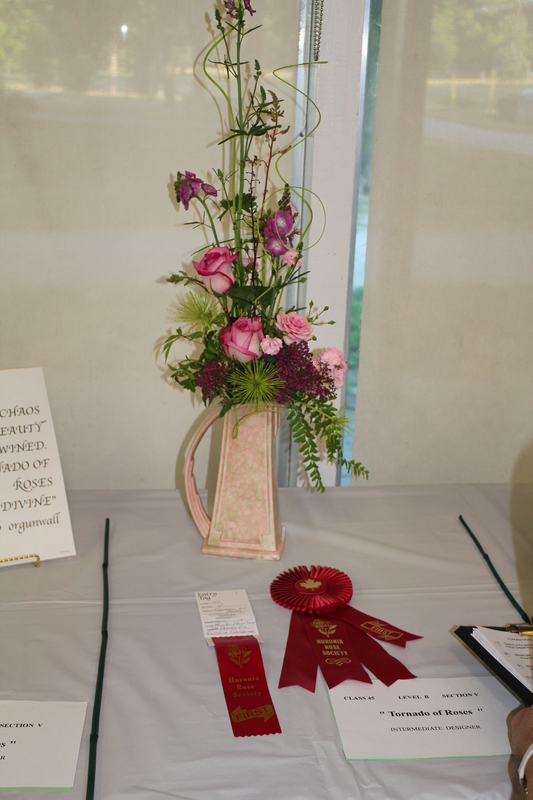 I’m sure I’m not the only one hoping for wonderful weather this year so that we can be ready to submit beautiful entries in the July 3rd Annual Rose Show! Good weather will also help with our community project, the Millennium Rose Garden on the waterfront, that blooms for the enjoyment of all (with the hard work and green thumbs of our fabulous volunteers, of course!). Stay warm, see you in the spring! Another year has come, and we must start organizing the activities of HRS. My responsibility, with suggestions from few other members, was to pick and order potted rose bushes to be sold at the Farmers’ Markets both in Barrie and Orillia. As you can see from the list we will have lots of variety and colour to choose from. There are some previous favourites, but enough new cultivars to keep your rose garden interesting. Along with the roses, we will also have a variety of interesting hostas and other perennial plants for sale. The dates for the sales at both markets will be on Saturdays: May 12th, 19th, and 26th from 8 am to 1:00 pm. The total plants to be sold is 150. Volunteers are urgently required for this major Fund-Raising Event. Please consider volunteering one Saturday morning or for a couple of hours as you know the funds are required to keep this Rose Society functioning. Please start spreading the word and we will see you all at the Farmers’ Markets. Gloria Brok, our presenter in April, will speak about the Biltmore Estate and Gardens in the mountains of North Carolina, built by the Vanderbilt family. It is open to the public for tours and includes a village and winery. The extensive estate gardens include a formal Italian garden, a shrub garden of 500 varieties, a spring garden of bulbs, an azalea garden, a 4-acre walled garden, a bass pond, a conservatory of orchids and tropical plants, and a four-acre Rose garden. The Rose garden has many varieties of roses in large beds as well as trial roses. Gloria will explain how they winterize and prune their thousands of roses each year. This presentation will show the roses in full bloom in early October 2017. Our annual Photographic Competition results will be displayed for everyone to enjoy. A preview of the roses we have for sale at the Farmers’ Markets will further whet your appetite to buy a few new ones this spring. Entries received: 4:30 – 6:15 pm Program: 7 pm. In May, we will sell potted Hostas along with Rose Bushes at the Farmers’ Markets, so, please save any leftover plant pots (approximately 1 gal. size). Our next newsletter in April will provide more details about a potting up event, when, where etc. It is with great sadness that we announce that Marjorie Bell passed away peacefully at the Royal Victoria Regional Health Centre, Barrie, on Tuesday, January 9th, 2018. 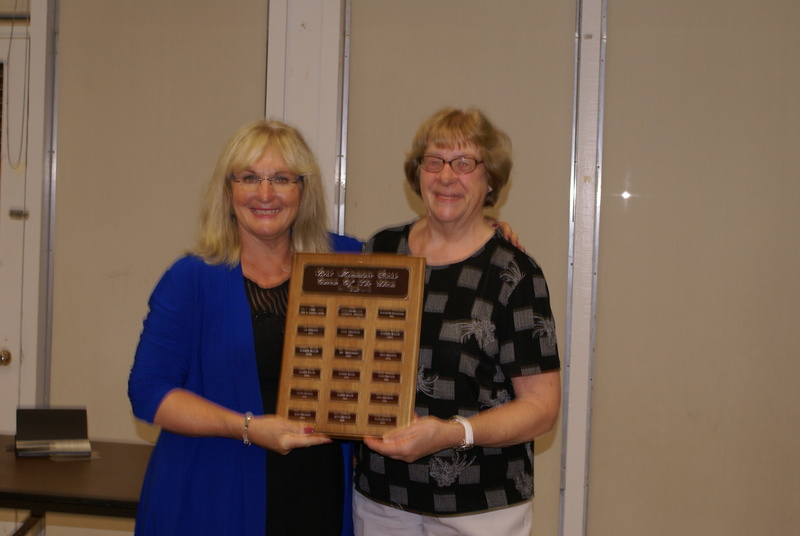 Marjorie was a founding member of the Huronia Rose Society, 1980, serving as president, treasurer and other positions. She was a founding member Oro-Medonte Horticultural Society (serving as president, secretary while serving on the board for 50 years). She was a Simcoe Co. Master Gardener where she contributed greatly to the gardening community. We are sad to report Reta Caldwell passed away at Soldiers’ Memorial Hospital, Orillia on Fri. Dec. 29, 2017. Reta was a charter member of the Huronia Rose Society and served as president for 2 terms with HRS, was chair of the Rose Shows for many years. Reta was an accredited GCO judge of Horticulture (‘83) and Design (‘87). She was a CRS Rose judge as well. 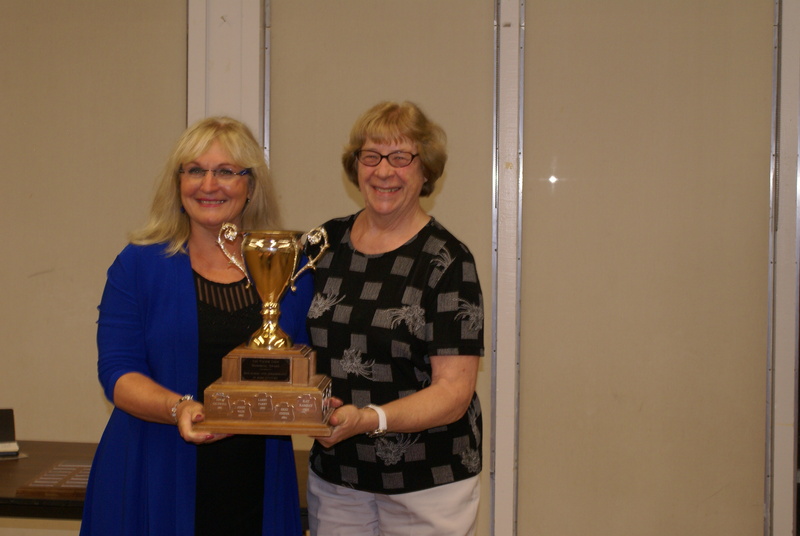 She was a charter member of Oro-Medonte Horticultural Society and served as president for 2 two-year terms. Dear New Member: An excellent question, because it is important to give the roses some TLC in the spring to get them off to a good growing start. Let’s begin first with removing any winter protection you may have used. For example, remove any soil, leaves, compost or mulch that you used to cover the mound of the rose in the fall. This provides good air circulation for the rose and removes any excessive coverage of the rose stems that could result in rot or harbor insects. Secondly, prune and remember not all roses need to be pruned, other than clean up and size control but whatever type of rose you are pruning Spring is the ideal time. Prune, when the leaf buds start to swell on the cane and in our Canadian climate, it is about the time the Forsythia starts to bloom. Pruning is necessary as it stimulates growth and flowering. Floribundas roses — Prune off any dead wood and prune stems to outward-facing buds 8–12 inches (20–30 cm) from the ground using 45-degree angle cuts. When pruning, aim to leave a framework of between eight and ten strong, healthy stems. Climbers – Climbing rose bushes should not have their main long arching canes pruned for two or three years, and then those long main canes should only be cut back a foot or so. If you cut back the long canes too much, the climber will not flower well or even at all. Shrubs – Cut main stems back by a quarter and slightly reduce side shoots by a few inches. Thin out congested stems to improve air flow, and remove dead, weak, damaged, or diseased wood. After pruning, it’s time to fertilize. Your roses will be growing, and they need nutrition, so it is time for their first feeding. 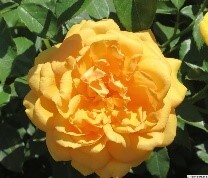 There are several good all purpose rose foods that you can use, but a general all-purpose fertilizer will also suffice. I use a handful of Epsom salts at feeding time (about a 1/4-1/2 cup) added to your choice of fertilizer for each rose bush. Alfalfa pellets can also be used as fertilizer. Lastly, Spring spraying should be used as a preventative method to assist with the reduction of fungus diseases throughout the growing season. A good example would be to use a dormant spray (Lime/Sulphur based dormant oil) as it generally kills any fungus spores of black spot that have over wintered. NOTE** You can only do this before buds appear on the canes. I hope I have answered your question by providing you with the necessary steps that must be done in the spring so that you can enjoy a summer full of rose blooms. What an interesting summer we have had this year compared to last year. Last year we needed rain and this year it hasn’t stopped stop raining. They stand as bare-naked ladies with all their leaves dropped due to black spot. I know they will survive but they look very unhealthy. Hopefully the month of September will help them to re-establish themselves before the winter comes. Fall/Winter is just around the corner and I am already thinking what I will change and plant next year. See you in September. Tues. Sept. 19 – Join us at an exciting meeting with Rene Schmitz, co-owner of Palatine Nursery, Virgil, Niagara region. We have been buying their hardy roses for our May sales at Farmers’ Markets for several years. He will share historic highlights of the development of roses through the centuries, bringing us the latest roses available. He also will donate some gift certificates, hopes to bring cut roses to give away. 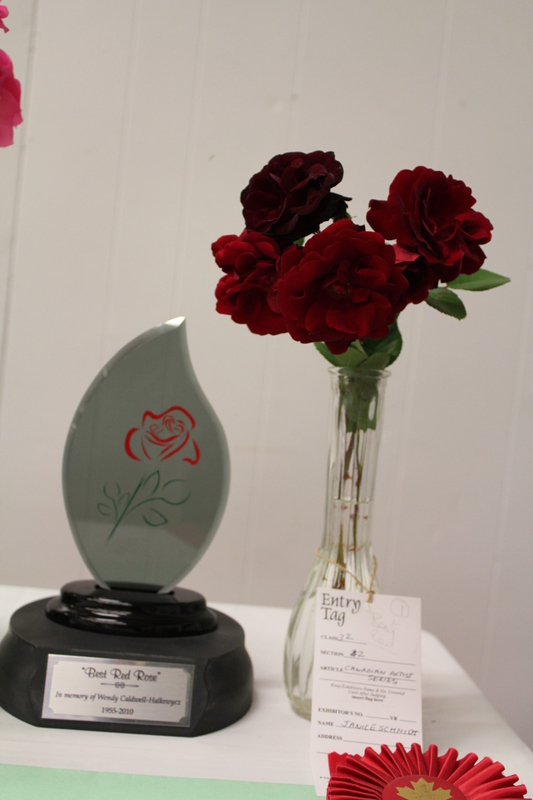 This evening will also be when our Awards from our Rose Show are presented to the winning exhibitors. Bring a guest who is interested in roses, more the merrier. Then, on Tues. Oct. 17th, our final meeting of 2017 will have Master Gardener, Anna Sauve, present “Carefree and Carpet Roses” that are popular with people who don’t have a lot of time to garden. That evening, Janice will receive your rose photos (each with an entry tag) for our Photographic competition. Memorial Garden – This summer has been totally different from all other seasons since we established it in 2000. All spring and summer, the plentiful rain has caused bountiful quantities of rose blooms, so much so that that the larger branches were bent down almost to the ground. The second week of June, we were informed that the city was fencing off the whole area for the rest of the summer. We would have to notify the city 24 hours before arriving to work (weeding, deadheading, etc.) and the contractor would let our volunteers inside the fence and “release us” when we were finished. Thanks to Jeanne Leong who managed to access the gardens to deadhead a few times and to Irene Slessor who helped Edna deadhead and weed until the end of July when we no longer had any access. Hopefully, Mother Nature will water the roses enough and they will survive without attention until the fence comes down. Driving past the location through August I could see they were bravely blooming away even though the usual audience of passers-by was not present to enjoy their beauty. The Huronia Rose Society is always looking for new people to serve on the executive and help with the day to day planning of the society. If you are interested in becoming a new executive member please contact Janice at jantim200698@gmail.com. Our annual AGM and elections will take place at the October meeting. I feel this way about our annual rose show, it was splendid. I would like to thank all the membership for their hard work in making it come together to celebrate Canada’s 150th anniversary. 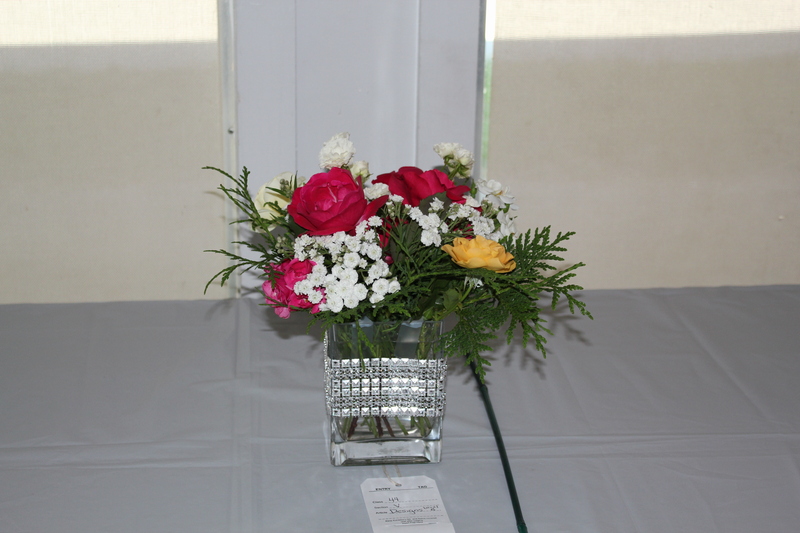 A special thank- you to Ellen Spencer, Michelle Lynch and Lynn Schnitter, the rose show committee. It would have been impossible without your wisdom and experience. 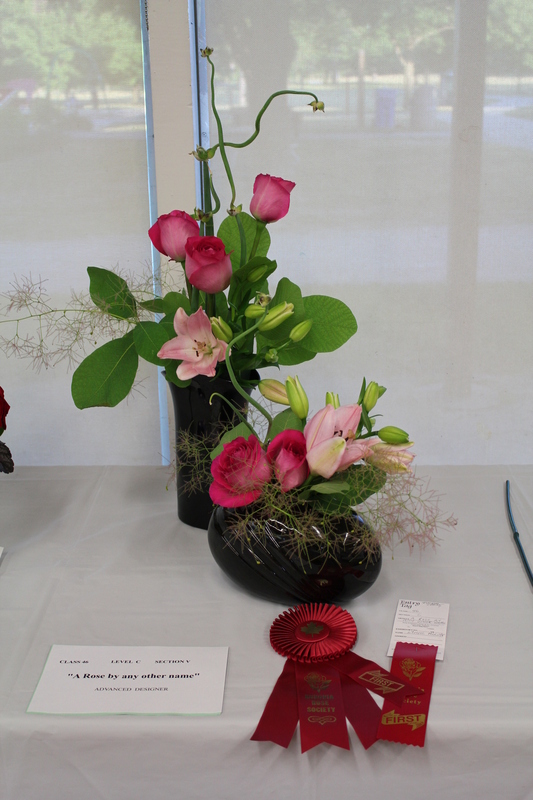 Our invitational class was spectacular with some stunning entries and even if our show was later than the year before the horticultural exhibits were lovely. Congratulations to all the winners! Some of the memories are captured in the photos attached and I look forward the show in 2018. 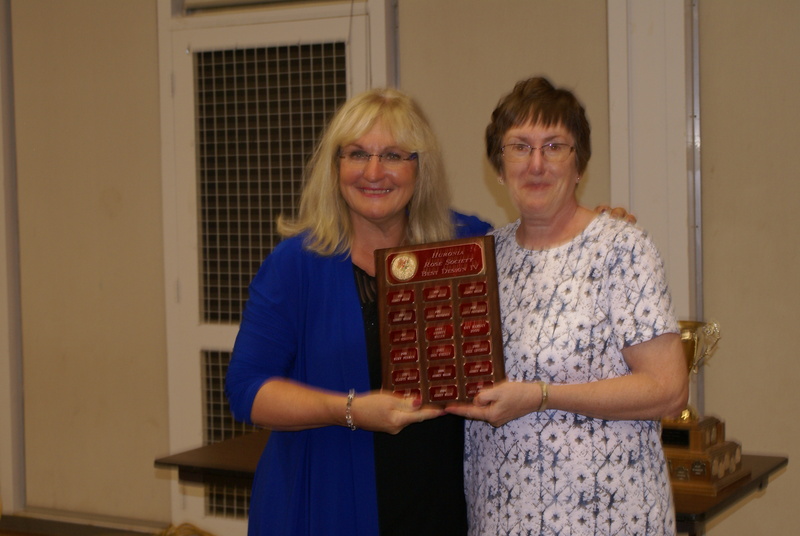 It is difficult to find words to express how thankful the Huronia Rose Society is for your dedication and hard work over the past few years. We are also grateful for the friendship that we share and our passion for growing and showing roses. We hope you visit us soon as you are always welcome and good luck in all your future endeavours. The number of entries were 48, in 2015 and 62 in 2016. Please bring this year’s entries to our October meeting with completed entry tags. Extra tags will be available at our September meeting if you need some. Is 2017 your year to win the best photograph in the show? The winner was Ellen Spencer in 2015, and Janice Schmidt in 2016. Vic and Virginia Foster were gracious hosts at our social evening in July. The weather was cooperative providing us with a lovely evening to enjoy each others company and the wonderful treats and drinks. Times like these are very precious as we can relax and talk to each other about a variety of topics which also included believe it or not ROSES. A good time was had by all and hopefully next year we can continue this tradition. Perhaps in your garden? Thank you, Vic and Virginia. Another fundraising event, the sale of potted rose bushes at the Barrie & Orillia Farmers’ Markets, has come to end. One hundred and fifty-four rose bushes were picked up from Palatine & J.C. Bakker Nurseries. Thirty-four rose bushes were sold before the markets. Thank you to the members who participated in the pre-paid/pre-orders. Sincere thank you goes to all and every volunteer who participated to get this event up and running. Thank you goes to Edna Caldwell for housing the rose bushes for the interim period and hosting the “perennial potting” event. Thanks to the members who donated perennial plants and helped with potting. Thank you, also, to Michelle Lynch, who Saturdays in May brought rhubarb and cut snapdragons from her garden, and Edna who sold them at her spot in the Fairgrounds Farmers’ Market. The sale of which was very successful and part of the fundraising. I enjoy the market as we are visited by repeat customers who tell their success stories about the roses they purchased from the HRS, and how our advice was taken seriously in planting, feeding, etc. Meeting new customers, who express amazement, when we state that roses do grow in and around Orillia. We do get the odd one whose rose did not survive or is not doing well. They quickly realize that our verbal and written instructions were ignored. Now, it is the time again to search the rose catalogues and place orders for beautiful and hardy roses for another fundraising event next year. The sale of potted rose bushes is not only to raise funds, but also to promote Canadian grown roses and to educate the public how easy it is to grow a rose in one’s garden. Please become a volunteer so that the tradition of selling rose bushes can continue in the future. In the Spring 2017 issue of “The Gardener for Canadian Climates” magazine, some background information on the development of this rose appeared. One of the parents of Canadian Shield was “Frontenac” of the Explorer series. ‘Frontenac’ has been the breeding parent in many other recent Canadian roses, including ‘Never Alone’, ‘Campfire’ and ‘Oscar Peterson’. Recently, I saw ‘Never Alone’ bushes in a garden centre. They were in full bloom, plentiful open blooms and buds to come. It was chosen to be a fund-raising rose for Cancer Society, promoted by a CFL retired player in memory of his friend. I was impressed with this patio-type rose bush. ‘Canadian Shield’ was bred at the Vineland Research Centre, a federal facility, breeding roses and other ornamental plants for Canadians. The roots of it’s strong rose breeding program go much deeper than its relatively recent history might suggest. Many of the most loved Canadian roses, including the Explorer and Parkland series, were introduced by Agriculture and Agri-Food Canada’s Hardy Rose Breeding program based in Ottawa and Morden, Manitoba. When this program was cancelled by the federal government of the day, much of the promising work was in danger of being lost. In 2010, the Canadian Nursery Landscape Association obtained rights to the stock, and in collaboration with the Vineland Research Centre, continued the breeding program. The program now focuses on developing cold-hardy, disease-resistant roses specifically for the Canadian market, but that will also be strong performers in international markets. Every year, more than 15,000 roses are planted at the main farm in Vineland, Ontario. The most promising are sent to collaborators across the country. By growing in a variety of conditions and climates, potential new roses are evaluated for their ornamental characteristics, disease-resistance, winter-hardiness and general performance across the country.